For this week I decided to try something different and hit some elevation instead. This will hopefully make me a stronger runner to hit the hills and add variety to my training plan. 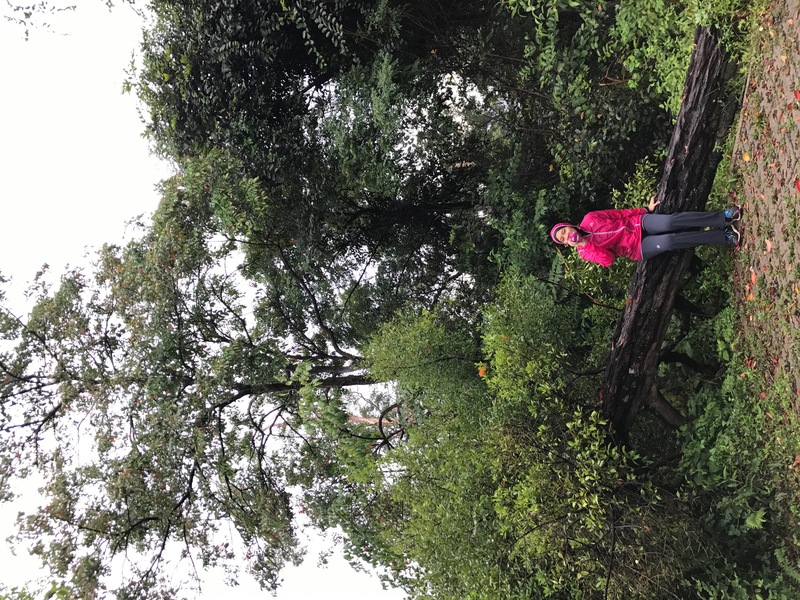 In a bid to encourage my colleagues to adopt a healthier lifestyle and support my employer’s outdoor event, I found myself back in Taman Botani Shah Alam again for a “hike” at Bukit Sapu Tangan. Disclaimer: “Hike” is a relative term here – If you have been running or a fairly fit person this small hill is very easy. After some quick warm up we proceeded to walk towards Bukit Sapu Tangan. It was still drizzling, and since the route was paved most people walked with their umbrellas too. Some of my colleagues brought their children along too, as the route was kid-friendly. What I love most about Taman Botani Shah Alam is that you tend to forget that you are still in the city. After about 1.8km of walking, we reached the peak. It was easy. 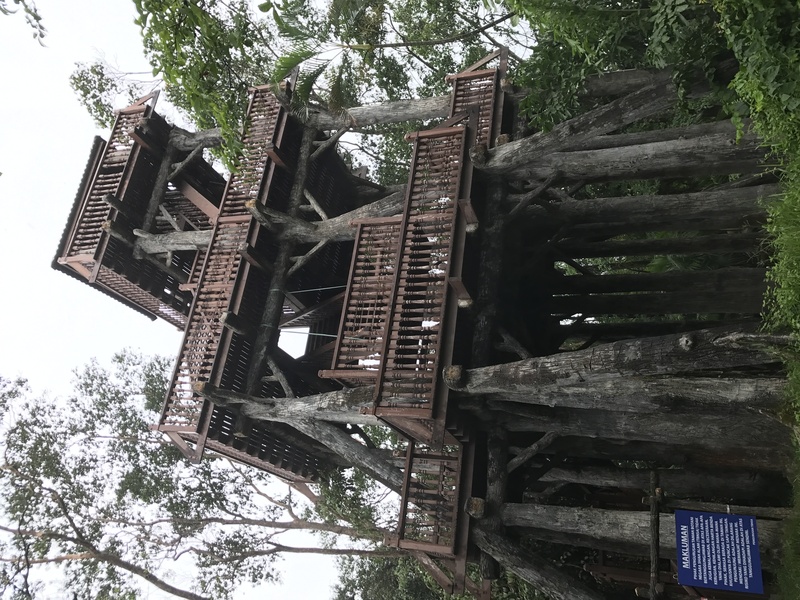 Unfortunately, there used to be a lookout post at the peak where you can see the whole city of Shah Alam but that facility has fallen into a sad state of disrepair. Gunung Nuang has always been my favourite place to train for trail runs. 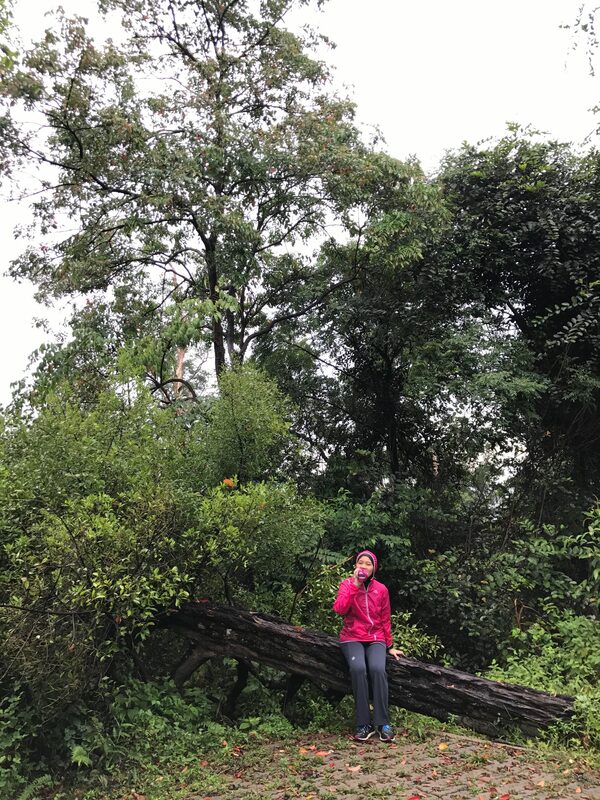 Trail runs are never flat and straight, and some routes are technical, and Gunung Nuang provides the perfect terrain and distance to train for trail runs. Gunung Nuang was challenging, as always. Despite conquering the peak for 3 times, it never gets easier. 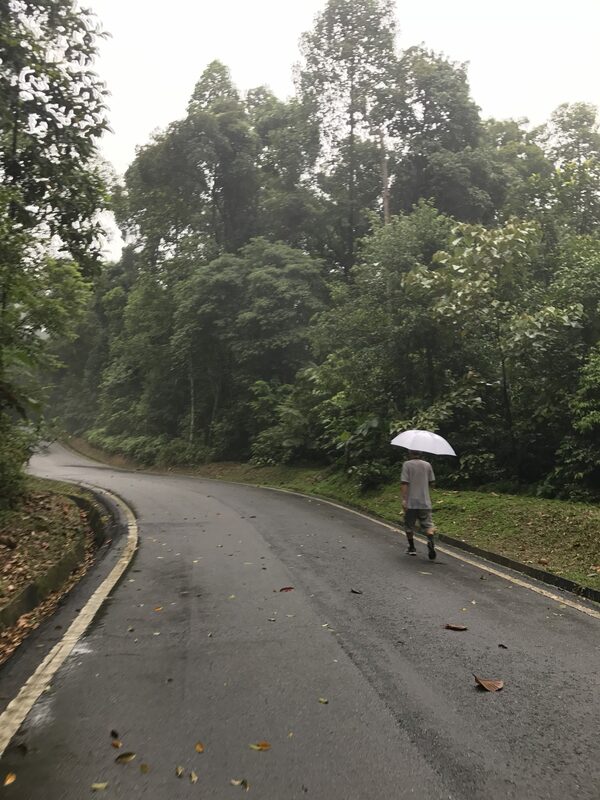 Mother Nature always throws unexpected challenges along the way, such as rain, fog, and temperature. I have learnt that this is a part of trail runs, which is one of the main reasons why there are loads of mandatory items when entering a trail run event. Unfortunately, we didn’t make it to the peak as it was slippery and muddy from the rain. After lunch, we descended from Kem Pacat and make our way back to the entrance point. After a quick change of clothes and prayer break, we continued another small 6km loop from the entrance point. So total mileage for that day was around 23km. 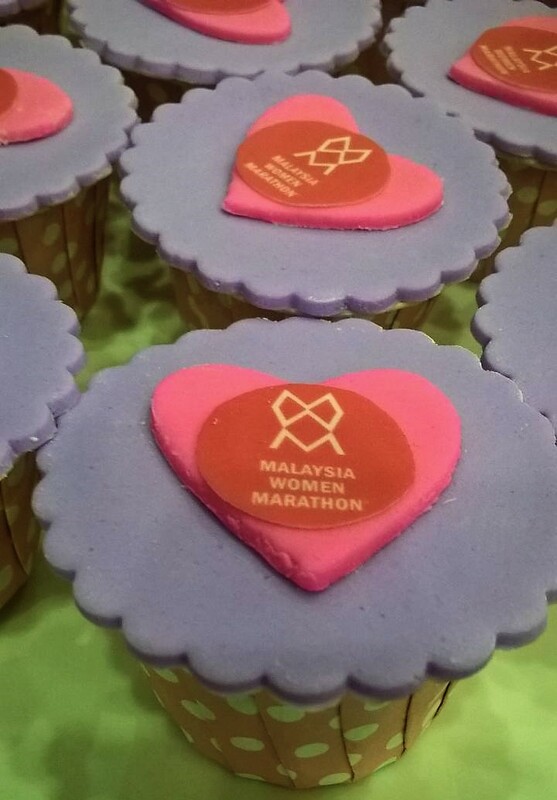 I can’t believe the Malaysia Women Marathon is on its 5th wood anniversary already. MWM needs no introduction so let’s go through what’s new and exciting at MWM this year? MWM ’17 will be held on Sunday, 5th March at Stadium Shah Alam. Like previous years, there will be MWM Expo on Friday & Saturday, 3rd & 4th March at Dewan Meranti, Level 3, Accapella Suite Hotel, Shah Alam. It is also where you pick up your race kit. 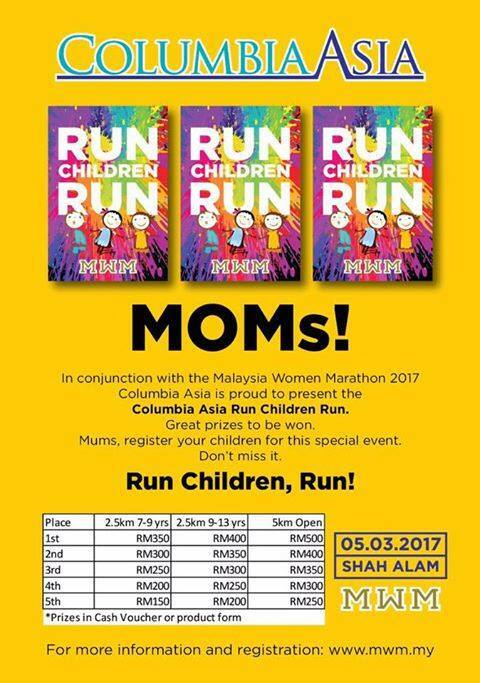 Echoing that, on the 5th anniversary of MWM, now the children can run 2.5km or 5km as there will be Children’s Run by Columbia Asia Bukit Rimau. Children as young as 6 to 12 years old can participate in the 2.5km run, while teenagers age 13 – 15 can race at the 5km run. 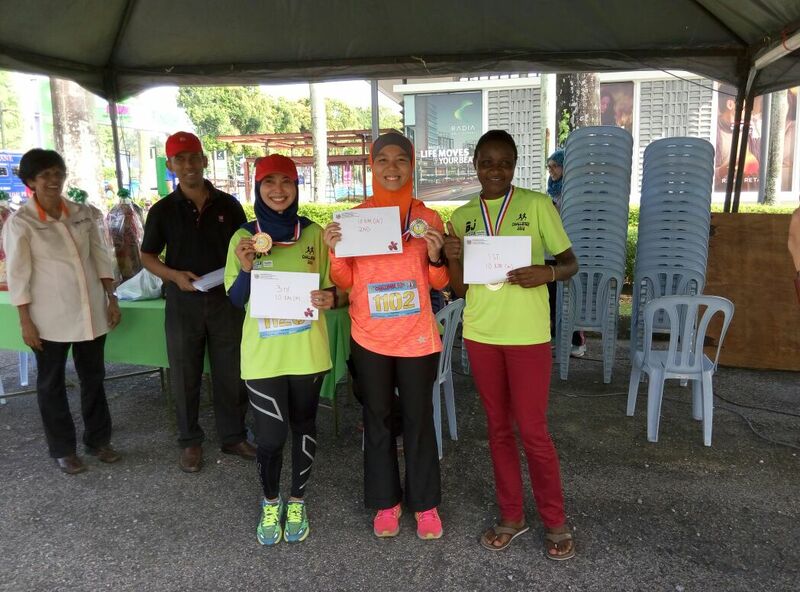 Running kid gets a running vest, bib, medal and cert for RM25 registration fees only. 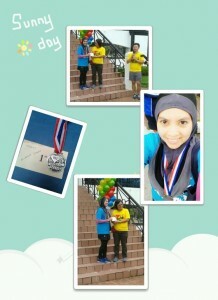 Children for 2.5km category will be running around Stadium Shah Alam. There are prizes to be won too! It is a good avenue to encourage active lifestyles among children and teenagers as recent studies conducted by the Nutrition Society of Malaysia reported that almost one third of kids ages 6 – 17 years old are overweight or obese. 2. What about other categories? Last date to register is 4th March, so you still have time, but don’t wait to long as you will have limited shirt sizes to choose from as the race day gets closer. Registration can be done at MWM registration page. Do follow their facebook page for event updates or changes. 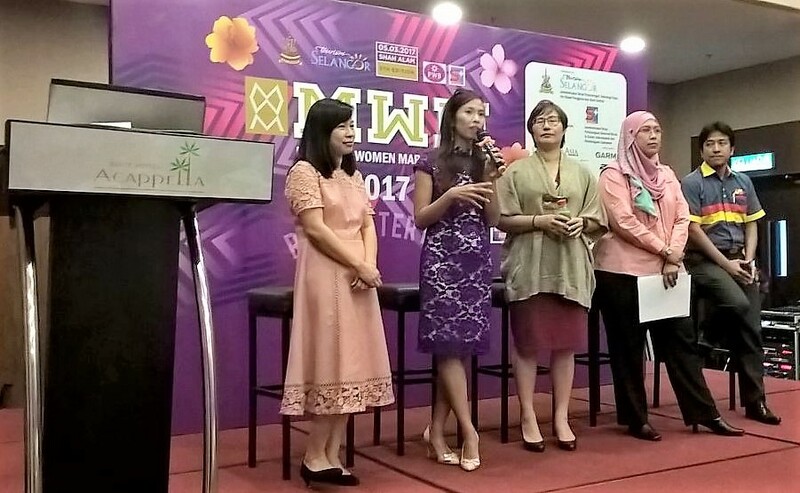 Like previous years, Tourism Selangor is the key sponsor of MWM, and YB Elizabeth Wong graciously supports women in running and I hope she runs with the other ladies like previous years. Karen Loh looking gracious and good always at the Press Conference today! MWM ’17 participating partners and sponsors! 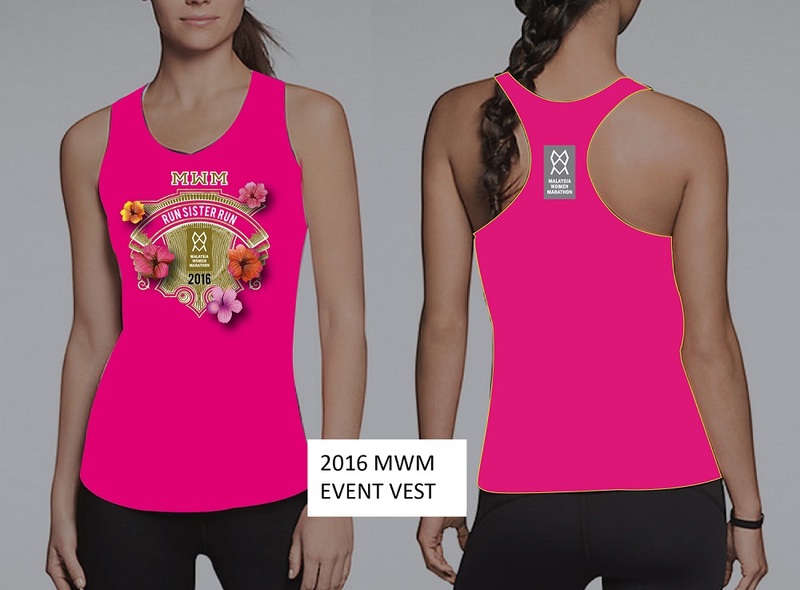 Just for MWM runners & fans, you can get Nashata Hooda Racerback Limited Edition in peach color from 15th Feb ’17 till the race day online at nashata.com or at Nashata store in Cyberjaya, MWM Expo or Race Day. Yes, we will have a booth at the Expo and Race Day. More new products will be revealed at introductory price as the date gets closer. Do check updates on our website and social sites. Last year a few Nashata runners ran the full marathon and this year, we will be there too. Below are our stories, where you can get an idea of what to expect at MWM. InsyaAllah, we will see you there at Accapella Suite Hotel or Stadium Shah Alam 3-5 March 2017! Happy Training & Happy Running! ‍?? ? 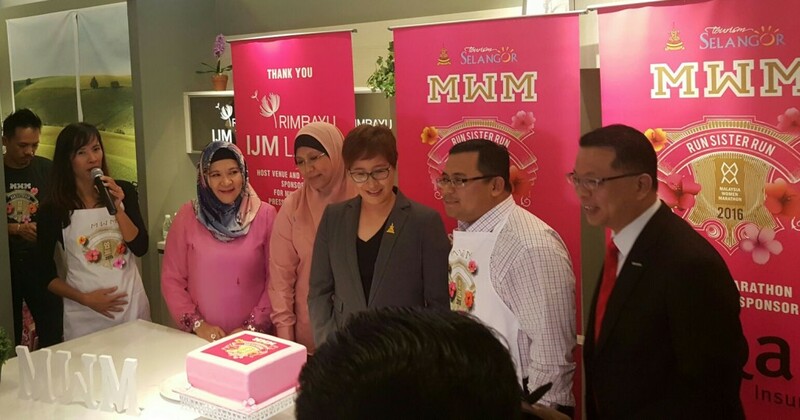 What’s Cooking at MWM 2016? When was the last time you get to know your own community? Some prefer to mingle through volunteering, such as through recycling programmes or “gotong royong”. Others like to invite their neighbours over during festivities. For me, I like to get to know my community doing what I love the most: running. Last Sunday I decided to join a 10K run around my neighbourhood in a small-scale event. What better way to know my neighbours than to run with them? There was no fancy sponsors and organizers – it was supported by the Residence Association and the local city council (MBSA), with prizes and goodies mostly contributed by neighbourhood shops and local businesses. As it was a simple event, there were not many participants. From my rough estimation, there were less than 100 women for all categories: 10km, 7km, and 3km. There were also 3 Kenyans only (no point trying to outrun them, my short Asian feet will never be able to keep up!). The route was also my regular running route – I knew every turn, elevation, and landmark by heart. Based on these parameters, I concluded that my chances to finish in the top 5 for the Open Women category was pretty high. Very early in the race (at about 1km) I was overtaken by the Kenyans. I let them take the lead, for I know I will not be able to match their 4:00 – 5:00min/km pace. As you might have read from my previous running posts, I am not a fast runner. I maintained my regular pace of 6:30 – 7:00min/km for the first half of the race, however I was leading among the women after the Kenyans and about 20 male participants. I can see a few other female runners just right behind me a few hundred meters away. 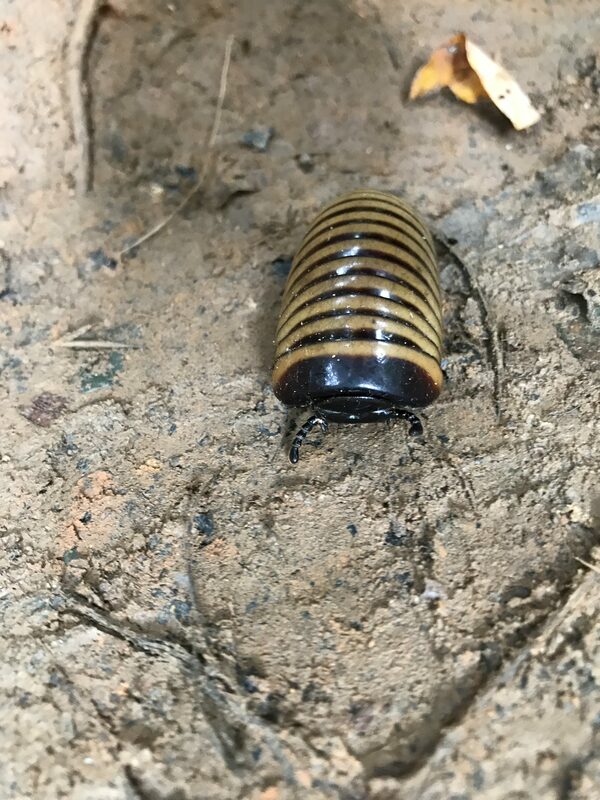 They eventually dropped out and started to walk. After securing that no female runner could overtake me, I got comfortable and complacent, so my pace slowed to about 7:30-8:00min/km. I cruised away until the finishing line and finished in 2nd place for the 10km Open Women category. Despite the small-scale event, it was surprisingly well-organized. With the exception of a few hiccups during the bib and t-shirt collection, the event went smoothly. They did not compromise on safety; police, RELA, and the ambulance were patrolling along the route. The direction and distance markers were clear, and at every water station there were enough water and even bananas. 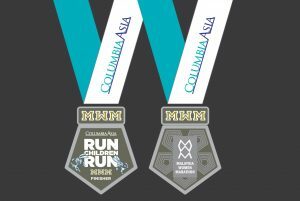 I wished that there were timing chips and the medal design could be improved, but since the registration was pretty cheap at RM45, the price point matches the quality of the event. I was happy that I managed to finish in 2nd place but I was more happy when I see participants having fun and enjoying themselves while getting to know each other in this event. In conclusion, we should always support our local community and contribute back in whatever way we can, no matter how small the event might sound or how insignificant our efforts might be. 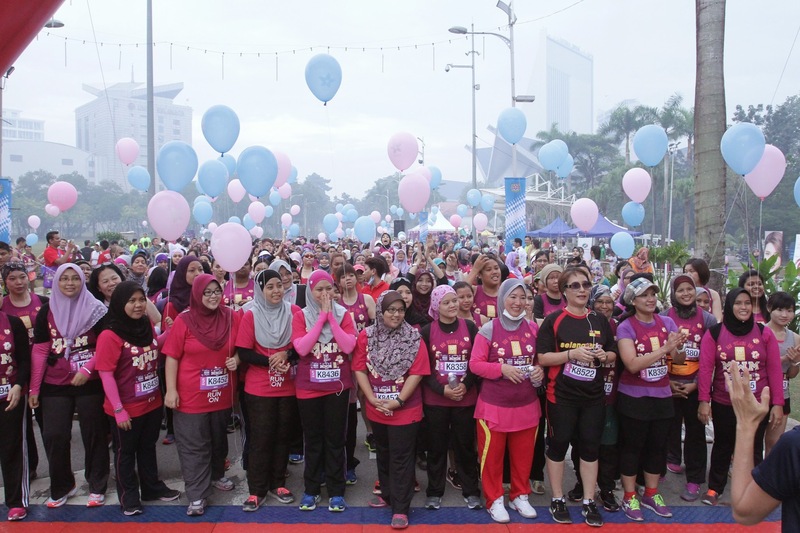 The Malaysia Women Marathon is back this March! 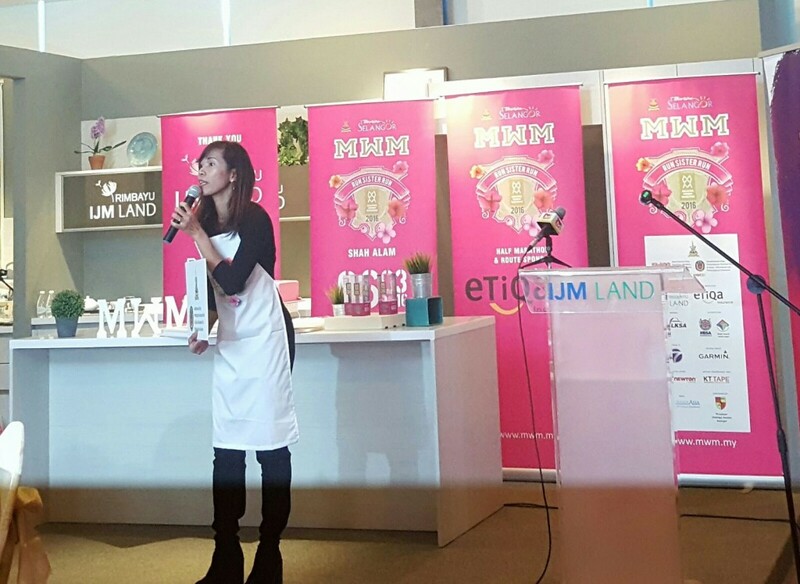 This year Karen Loh, the Race Director welcomed the guests and media in an apron and long boots. Yes, Karen is full of surprises, so be prepared to get loads of them with classy feminine touches at the run! 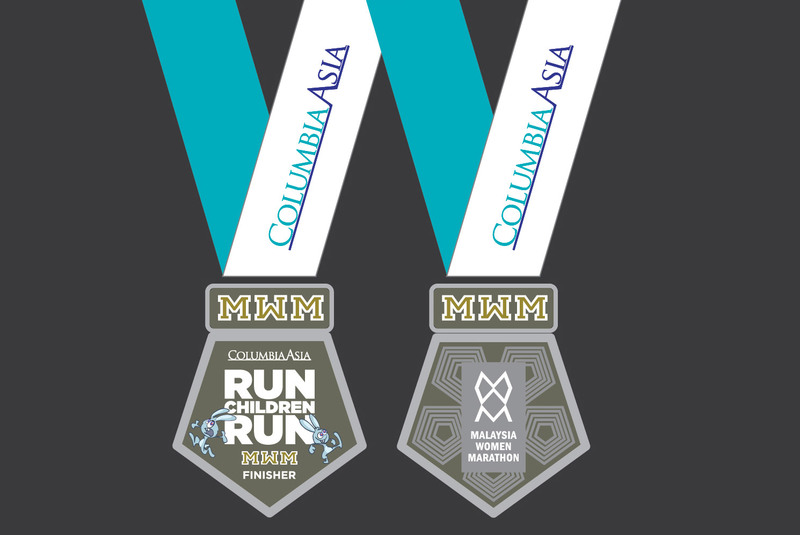 There are 4+1 categories at MWM 2016: 5km, 10km, 21km and 42.195 km. The other category is for charity where corporate companies can participate in a 3km race. 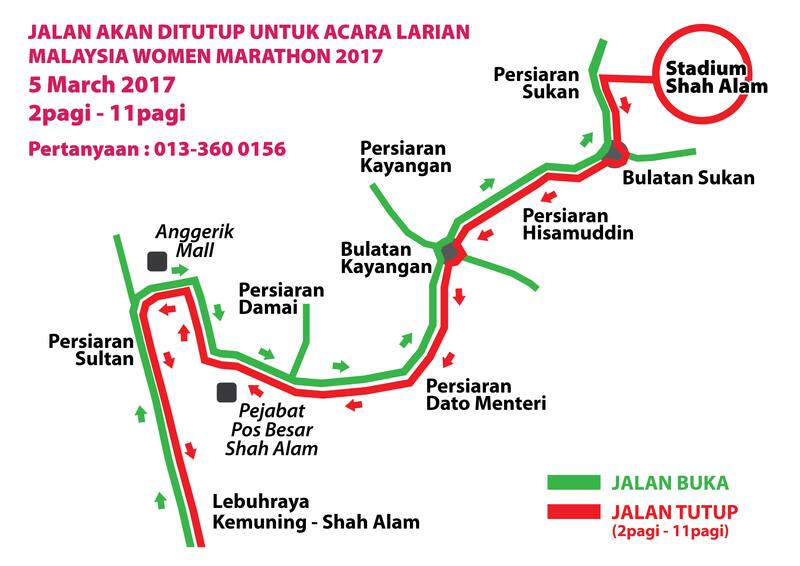 The date of the race is 6 March (Sunday) and the flag off venue is the same as previous years; Dataran Kemerdekaan, Shah Alam (GPS Coordinate: 3.07266, 101.515861). Race Kit Collection starts 4th March – 5th March at Bandar Rimbayu IJM Lands (GPS Coordinate : 2.941069, 101.54636). Make sure you use GPS coordinates as I couldn’t find Bandar Rimbayu IJM on Waze nor Google Maps. 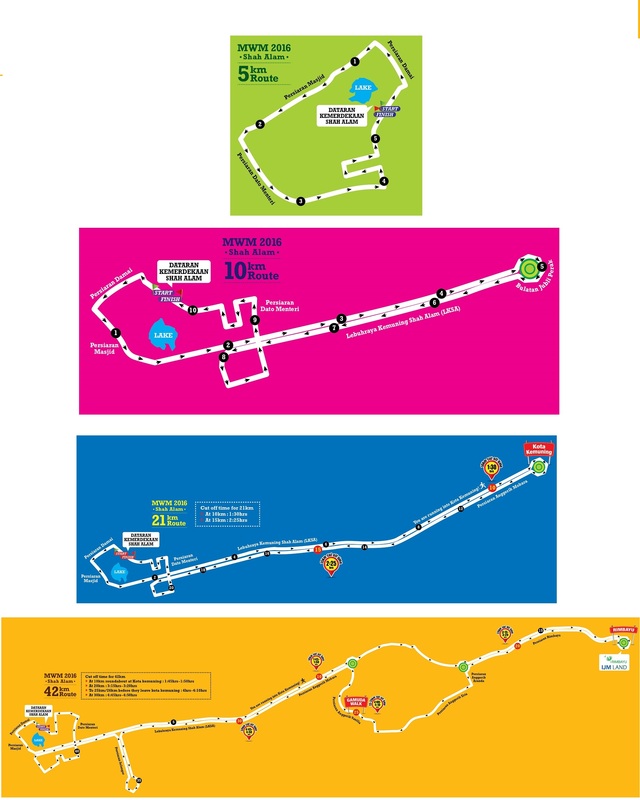 Those who are running full marathon would start from Dataran Merdeka to Rimbayu and back to Dataran Merdeka. 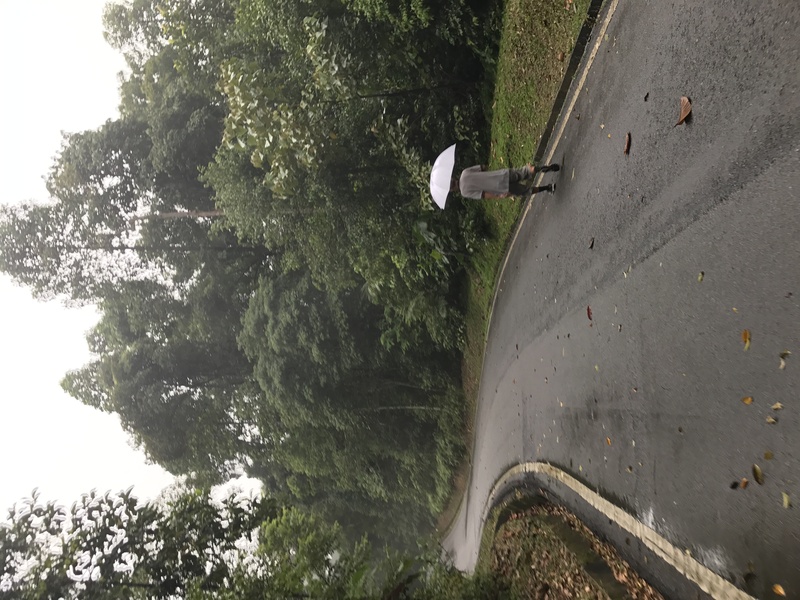 The roads to Bandar Rimbayu are ushered by lushes trees from rain trees to palm oil trees so do expect a nice cool run. Here are all the routes at a glance. What I like about MWM this year is the long sleeves running tee. Yay, finally, a tee that suits our hot and sunny weather. Assuming you run a full marathon for 5 hours, you would be on the road till 9am. In Malaysia, after 730am, the morning sun can give you a sun burn. 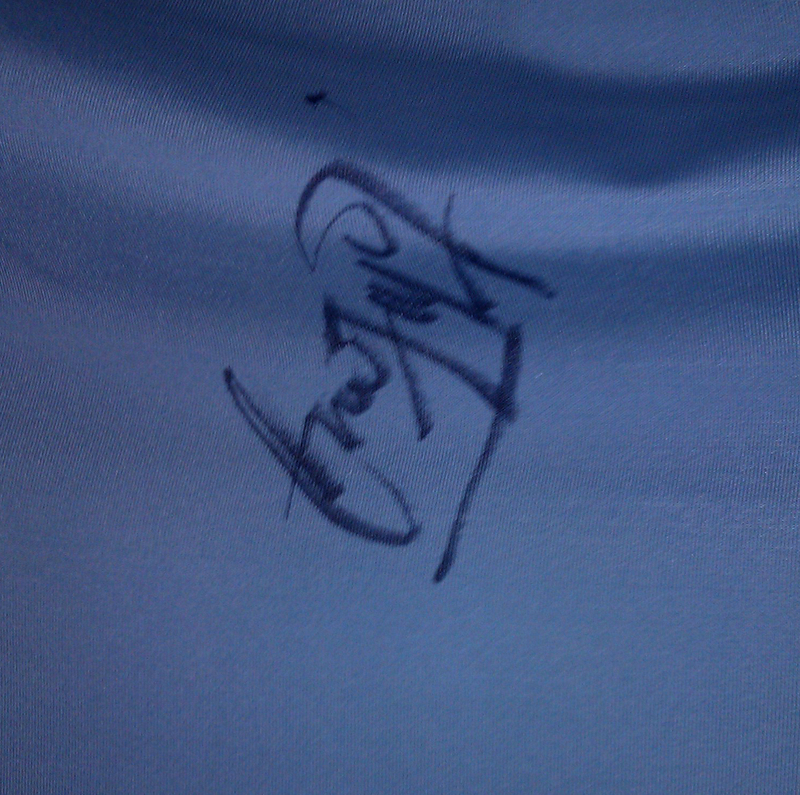 Unfortunately the long sleeves was just for press conference. 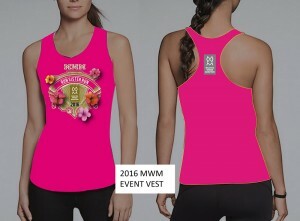 For the run, you would get the running vest. 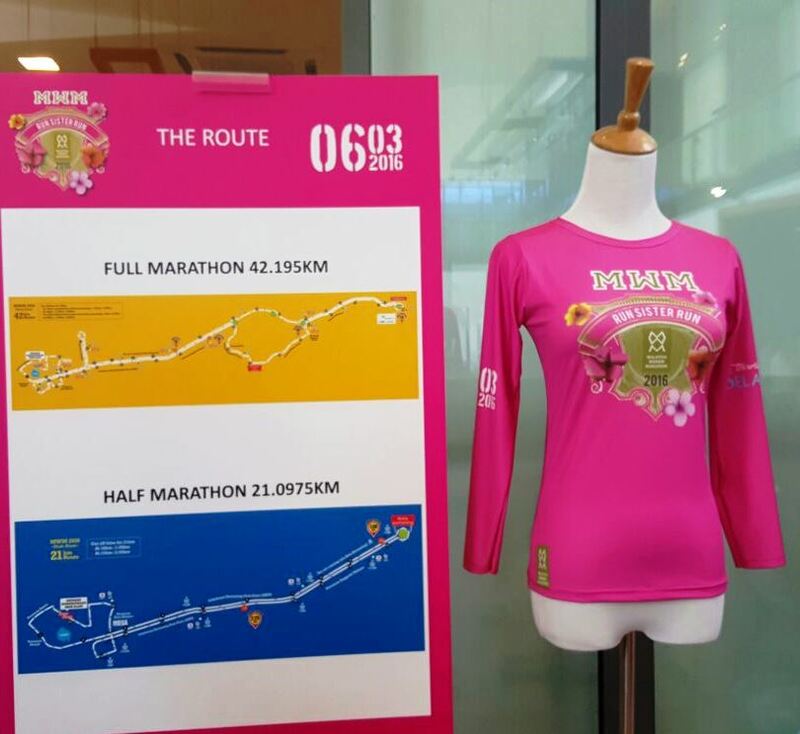 RUN SISTER RUN is the theme for this year and you get the print together with a gold emblem on the running tee. 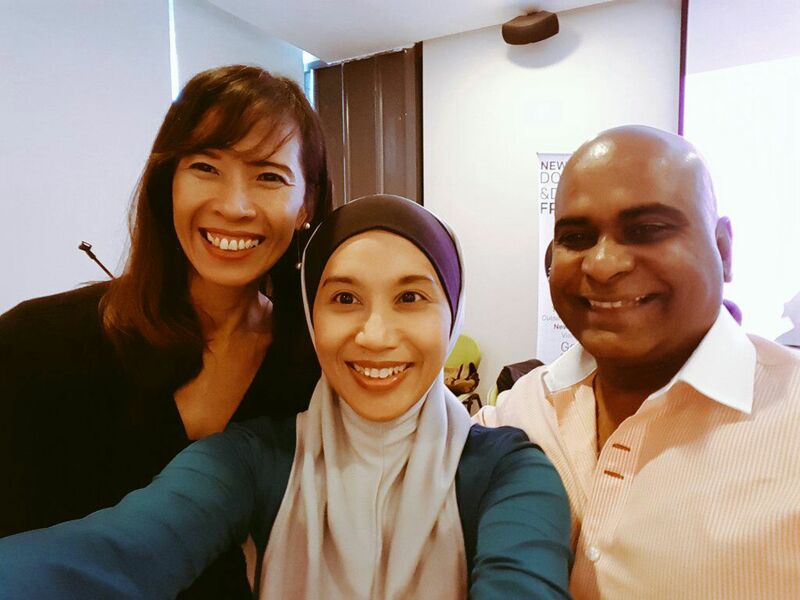 Not only there was the Queen of Marathon, Anand the Orange Man from Hooha was also at the Press Conference to give support ! 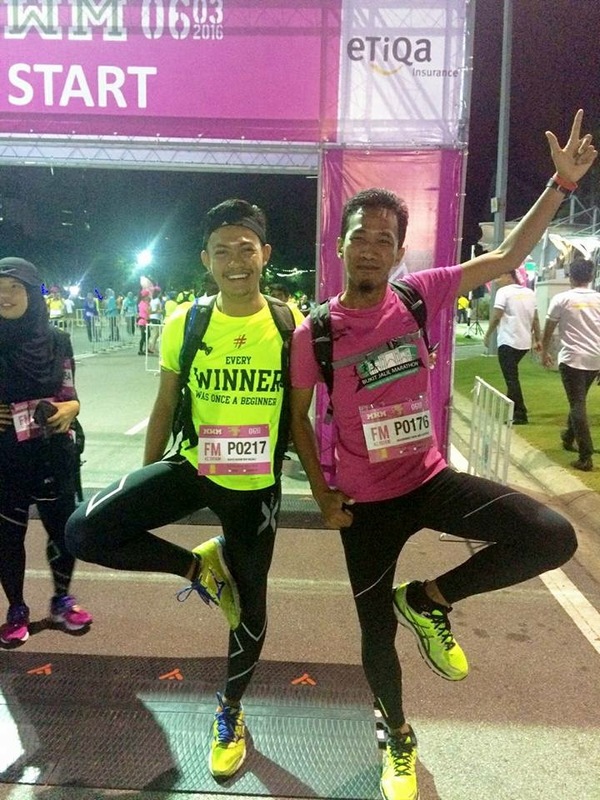 I also bumped into Kelvin Ng, one of the male pacers at MWM 2015. 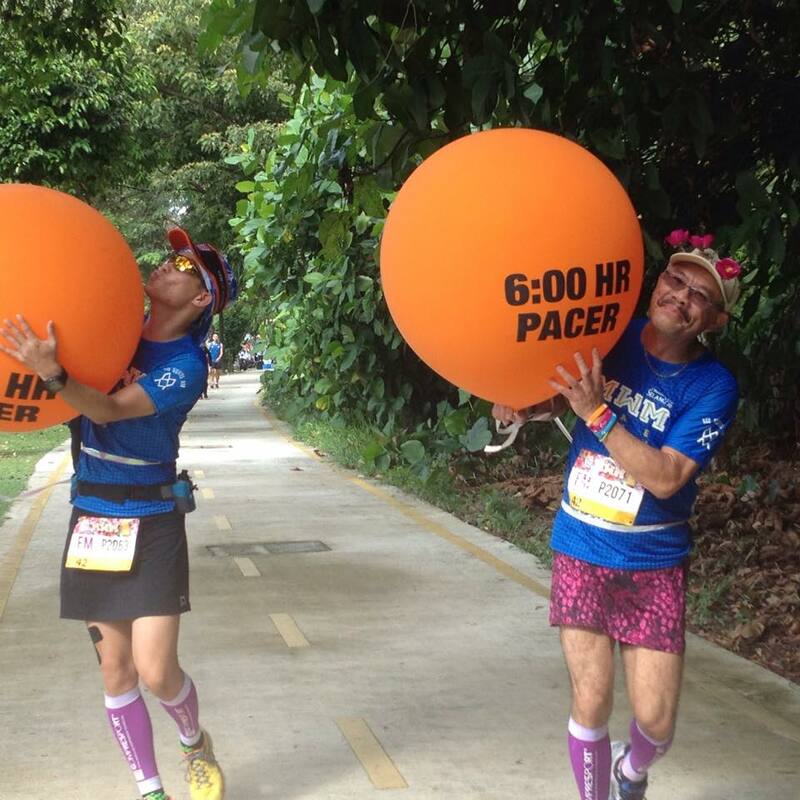 I was following him towards the end of my run last year and I am thankful for having a witty pacer like him at MWM. I hope he paces again this March! 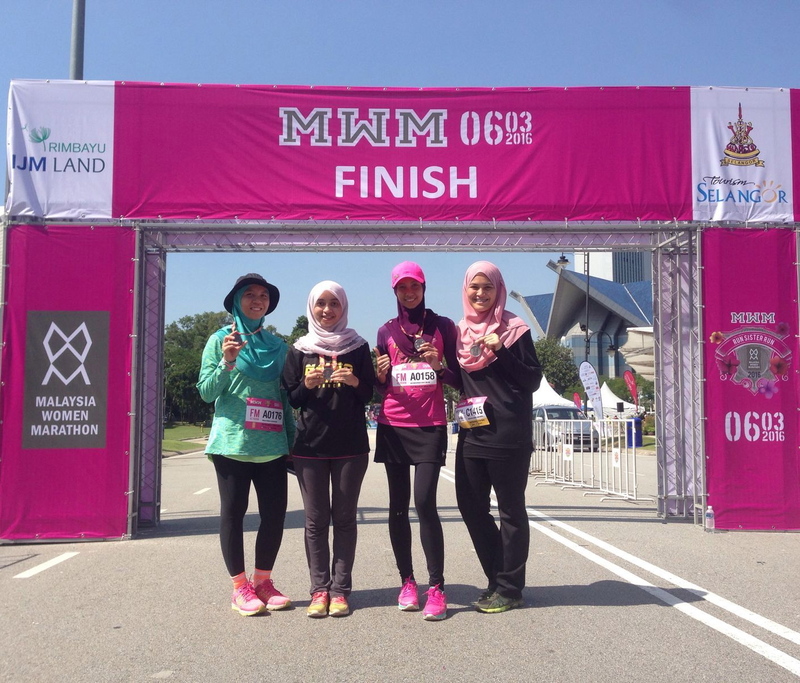 I did my first full marathon at MWM 2015 and I encourage first timers to take the opportunity to push yourself to the next level at MWM because it is woman-friendly and super fun! 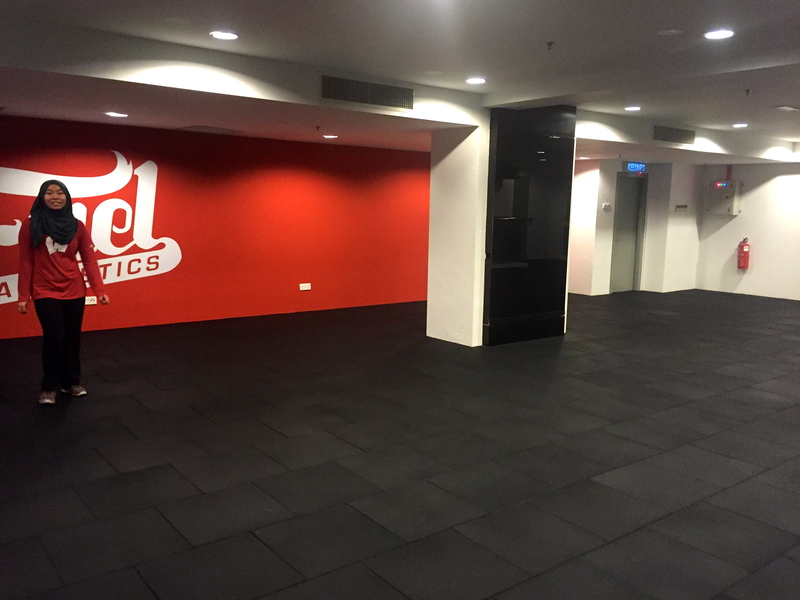 You can read my experience at MWM last year here. Do expect to see more diverse and fun runners at MWM. At the press conference, I was happy to meet Wen Li and Shirley Chan of Running Toones and 261 fearless group. I hope to connect you ladies with these passionate runners soon. 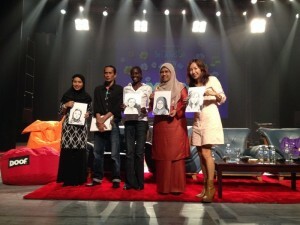 Shirley Chan started to Draw the Running Toones, How Cute! Nashata sponsors a few seasoned and new runners for full marathon this year so don’t forget to look out for them. Please run with them too and let’s make the run more exciting for us girls! 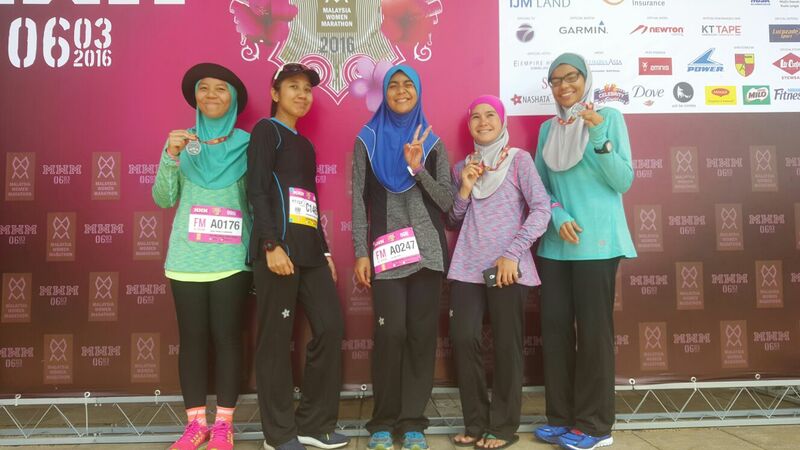 Some of the runners are Intan Suraya, Eda Fatimawati, Efah the founder of WOW RUN, Azlina or widely knowns as Along, Aina the WeekendRunner, Mimi Abdul Rashid and Nahsuhah. 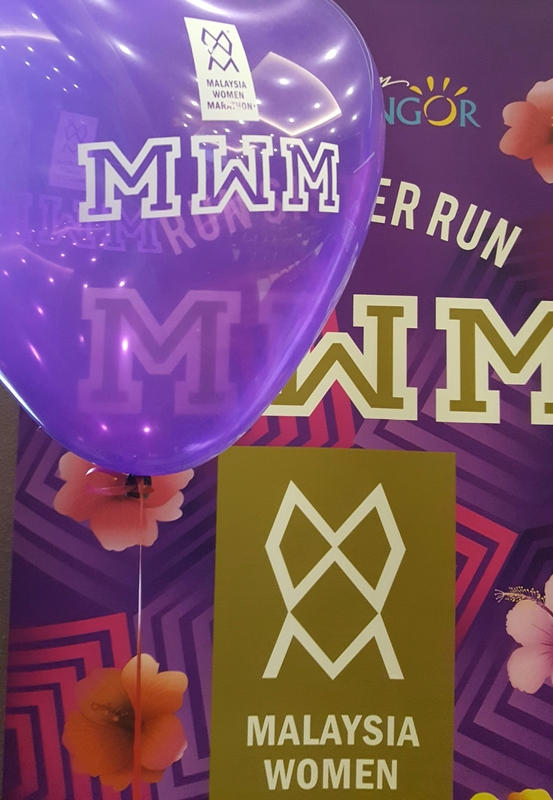 We will be at the racekit collection to feature our new innovative sports hijab so do drop by and check out our hot selling items & new collection – to be featured at MWM Expo! 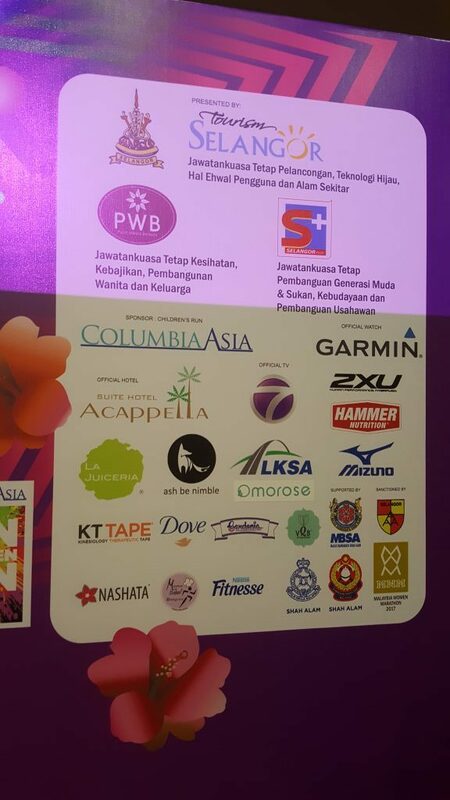 Lastly, a very special thanks to the sponsors and organiser for organizing MWM for the 4th time! Registration is still open so hurry and get your friends to run with you at MWM.MY. 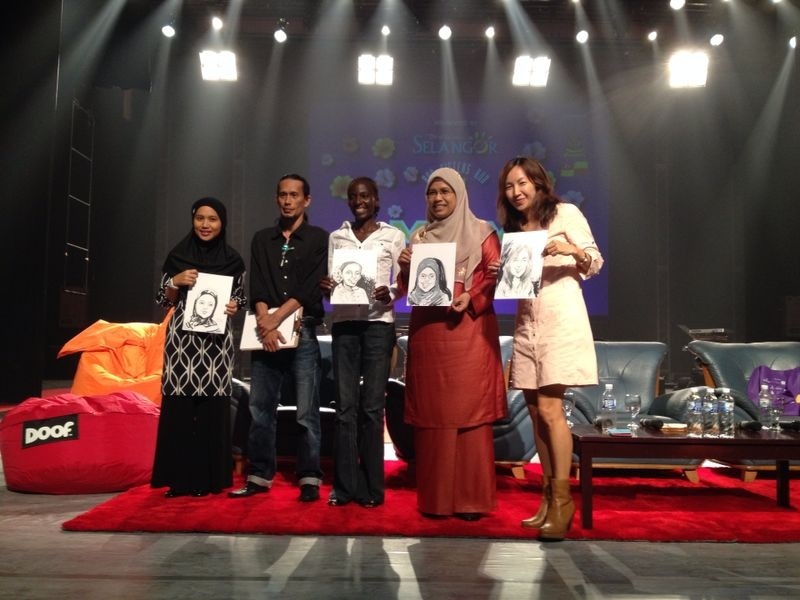 The early bird prices end 22nd January and they range from RM38 – RM98. Wait no more and register today! I’ve been on a yoga roll lately. I think I was drawn to it because it has principles so different from running – non-competitive, heart-pumping without the adrenaline rush, and taking your time to focus on progress instead of perfection. Yet I think it complements my running routine really well – I learn to listen to my inner-self, build strength and flexibility, and helping me to breathe better. Contrary to popular belief, yoga is not all about meditation, chanting, and relaxing poses. 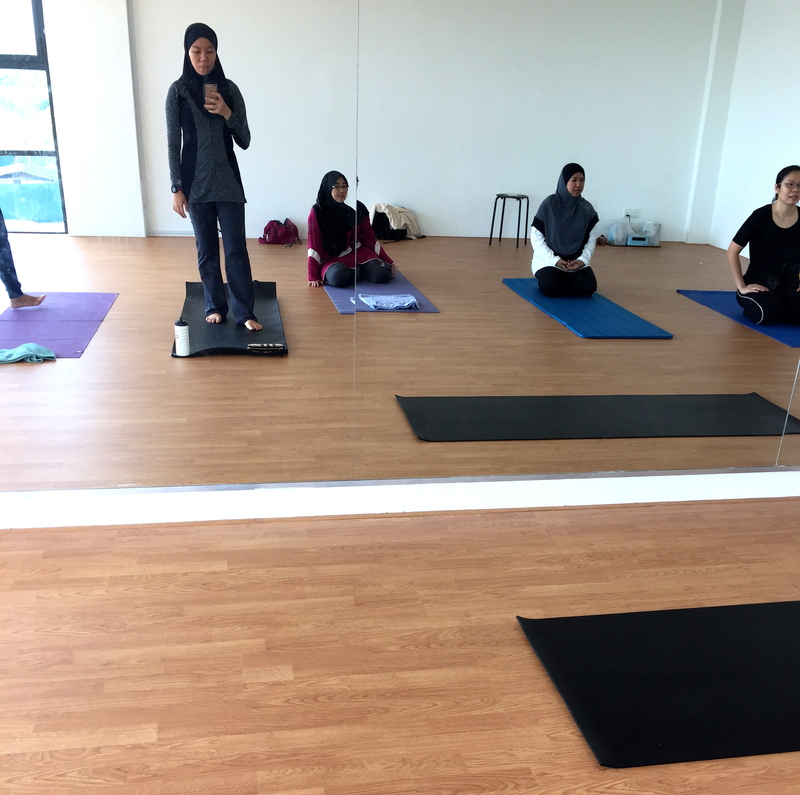 Thanks to Fit Muslim Girl’s blog post on Which Type of Yogi are You?, and my previous experience with Hot Yoga, (now I know it’s called Bikram Yoga), I never knew there were so many different types of yoga to explore! 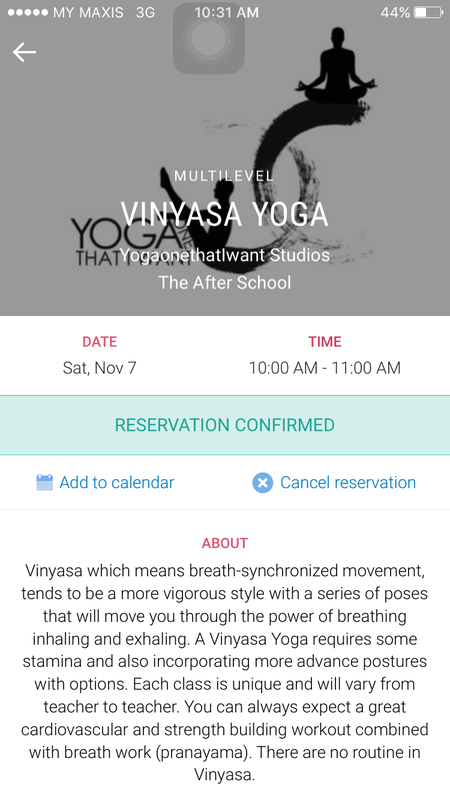 So this week, I decided to try a different type of yoga called Vinyasa Yoga by YogaOneThatIWant (YOTIW). As usual, I booked this class through KFit. Isn’t KFit awesome? Such a nifty and useful little app because I can continue to explore different types of work out without having to commit to a hefty gym membership. Based on that description, I knew this time around I was not expecting anything relaxing or stretches to straighten any kinks in my muscles. 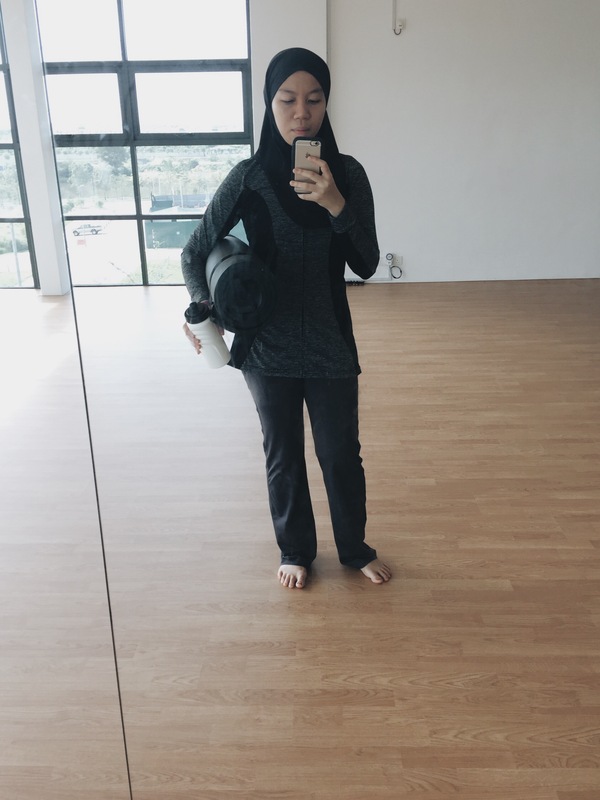 I was prepared for a challenging work out, and it will be a good thing because I really needed to work on toning, strengthening, and balancing. Vinyasa is also great for people with joint problems because they can get some cardio work out, minus the high-impact. As usual, I like to keep things simple when it comes to yoga. Nothing like a good Nashata Azeeza Zip Up top and my favourite Iman hijab so I can focus more on my poses, not my outfit. Plus this outfit hugs the body at all the right places, so your top won’t slide down in downward dog pose or other inverted poses. Love the small class. Since there were not many participants, the instructor could go to everyone and check on their poses. We were closely guided to turn or stretch the right muscles first instead of just rushing to get a pose perfectly done. At the end of the 1 hour session, I got more than just toned muscles; I was also more aware of my posture when I sit or stand, and I was mentally recharged too. 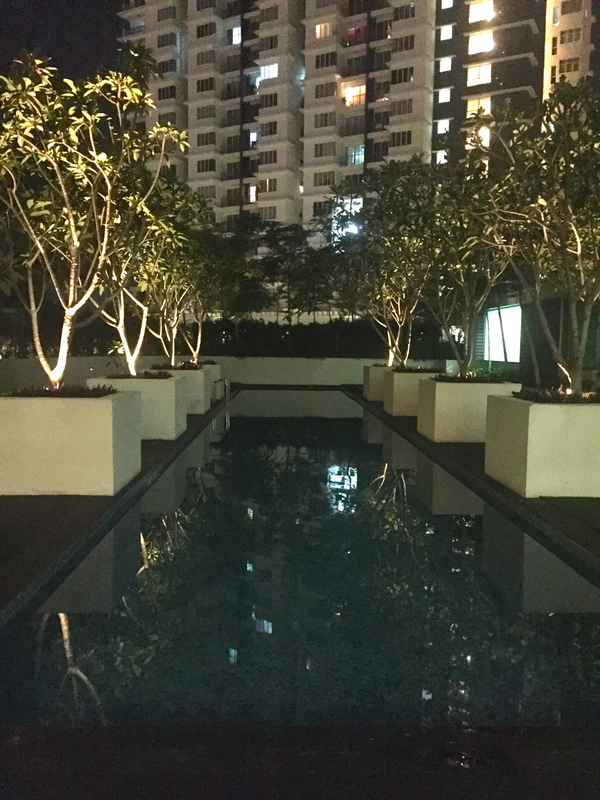 I guess Vinyasa yoga helped me more than just finding my balance physically – it also helped me to balance my mind to simply live in the moment. Happy International Women’s Day to our readers. Did you do anything special on Women’s Day? Many sisters spent their day making their marks, pushing themselves to a different level on the 8th March 2015. 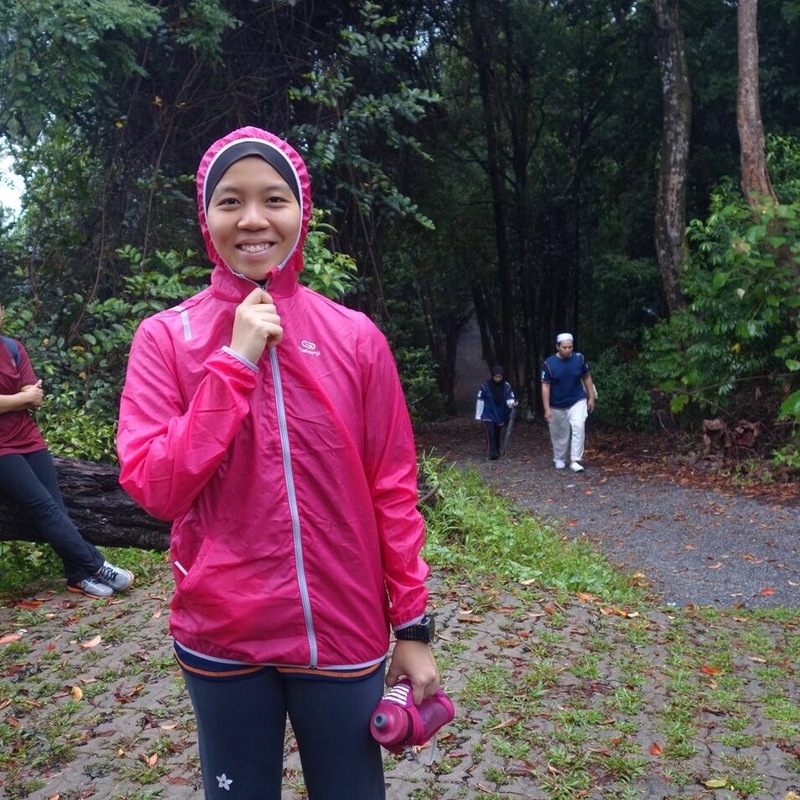 Nahsuhah, a 22 medical student at UNIMAS Sarawak, completed her virgin Full Marathon (42.195km) on the 1st March 2015 at the X12 Dark Run, Nexus Karambunai Resort & Spa, Kota Kinabalu, Sabah. She finished top 2 for Women’s Open Category at 4 hour and 54 minutes. 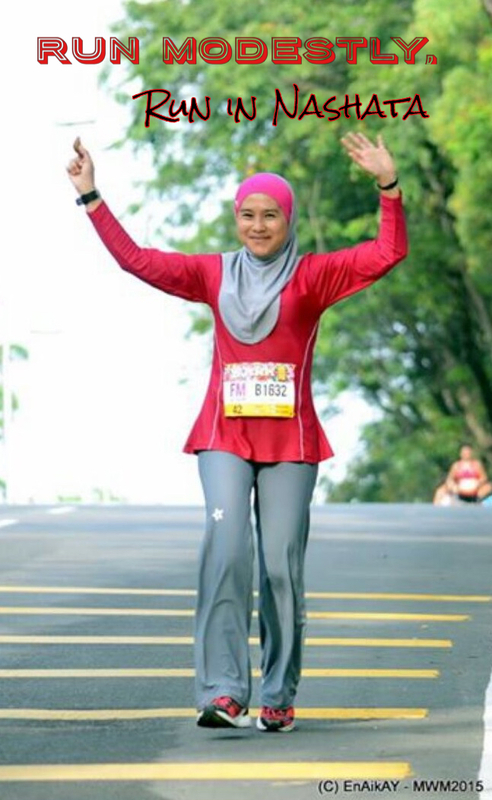 Seven days after her first full marathon, she competed at the Malaysia Women Marathon in Shah Alam, where she finished top 7 for Emerald Category. She improved her performance and finished within 4 hour and 49 minutes. 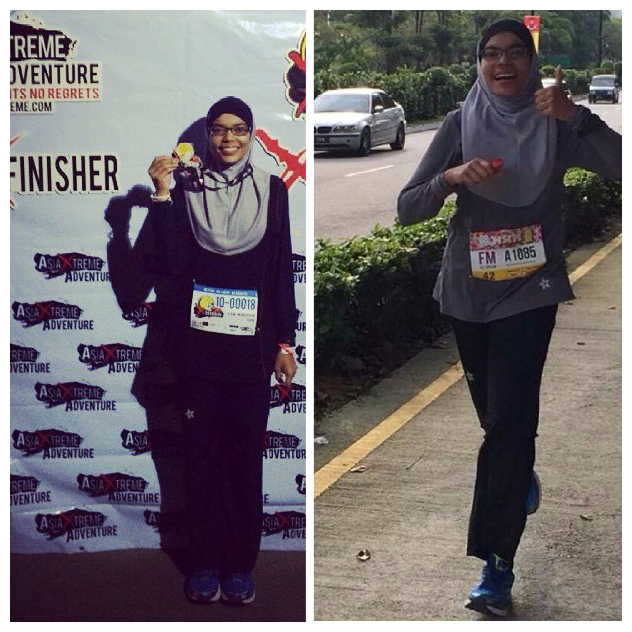 She flew into Shah Alam to brave through her second full marathons in a week! Isn’t that amazing! 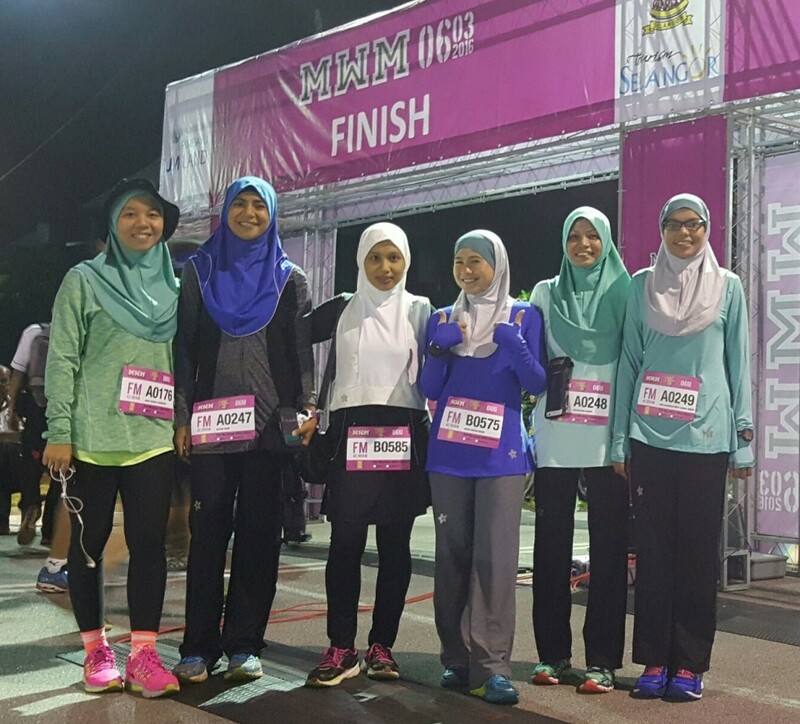 10 sisters of Nashata, including Nahsuhah, Intan Suraya, Azlina, Arliza, Masnida and Azyan ran Full Marathon at MWM. Some of them are amazing women who ran their virgin marathon. 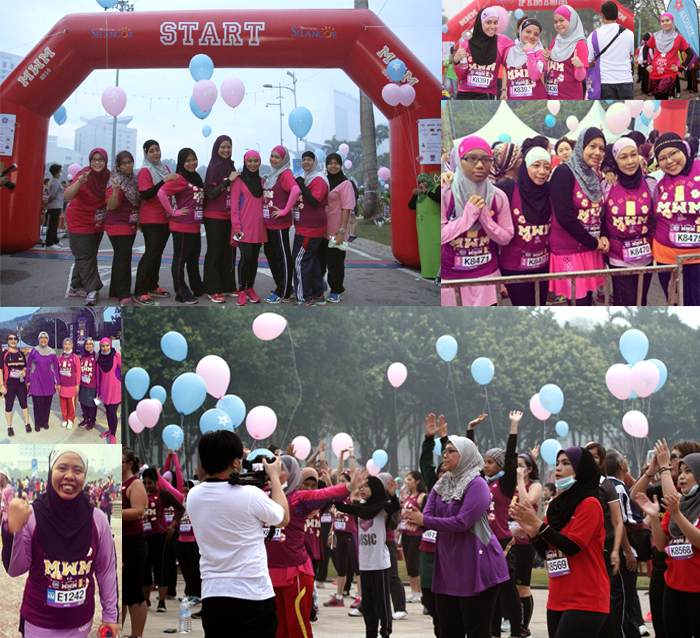 It was an amazing experience as the run not only brought them together, but also strengthen the sisterhood among themselves. It takes a strong and determined person to run a marathon. Whatever the distance and category it may be, 5km, 10km and 21km all finishers and pacers are Winners! 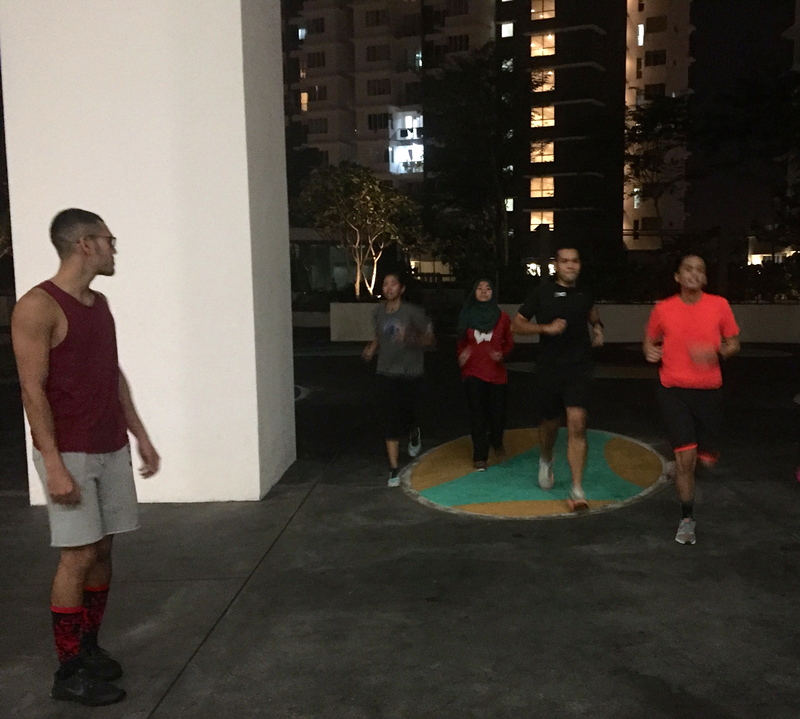 There were family members who ran together, friends from old school, university and workplace who decided to catch up and ran together. Eat, Sleep and Exercise – A healthy arrangement for girl get-together. Some paced their family and friends, some ran for the fun, and some cheered for each other till the finishing line. Whatever the reason may be, it was definitely for the betterment of one’s body and soul! Run Modestly, Run in Nashata! What is next for those who have graduated from Full Marathon numerous time? 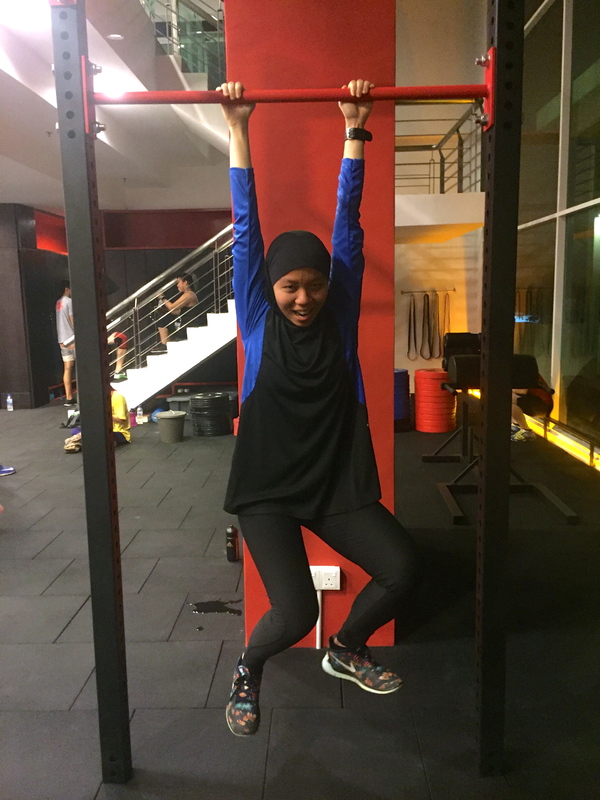 Eda Fatimawati, Nashata’s Fitness Evangelist, who ran numerous full marathons ran her first ultra on Women’s Day! 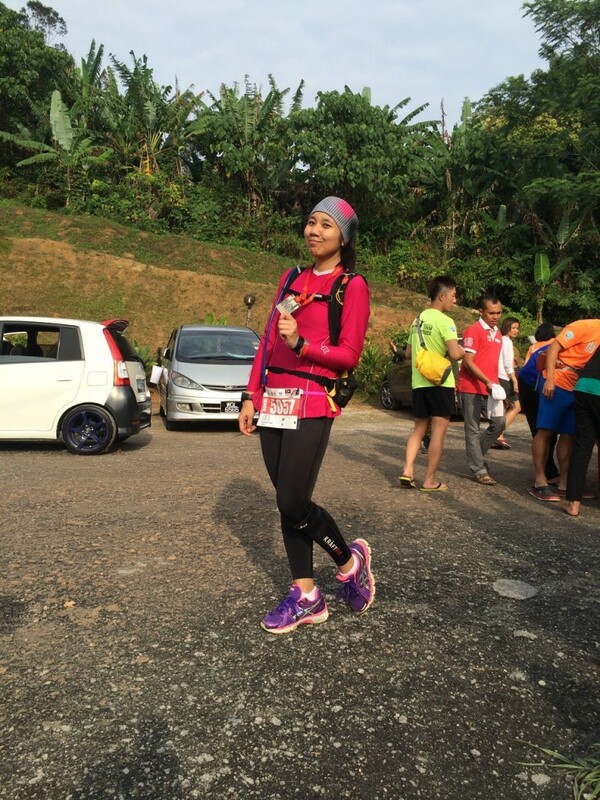 She ran and finished strong 50km at the TiTi100 Road Ultra Marathon. Our sisters have accomplished fitness to the next level on Women’s Day. CONGRATULATIONS! Lastly, here’s a special pose by Intan Suraya when she ran full marathon at MWM! We are grateful to have wonderful customers and because of the support from our sisters and customers, we thrive to do better. We receive many feedback from our customers, and we truly appreciate them. We are also touched and happy that some of you take the trouble to send us pictures, write to us and share your stories; to inspire other sisters to be active in sports and take better care of beautiful vessels Allah give us. 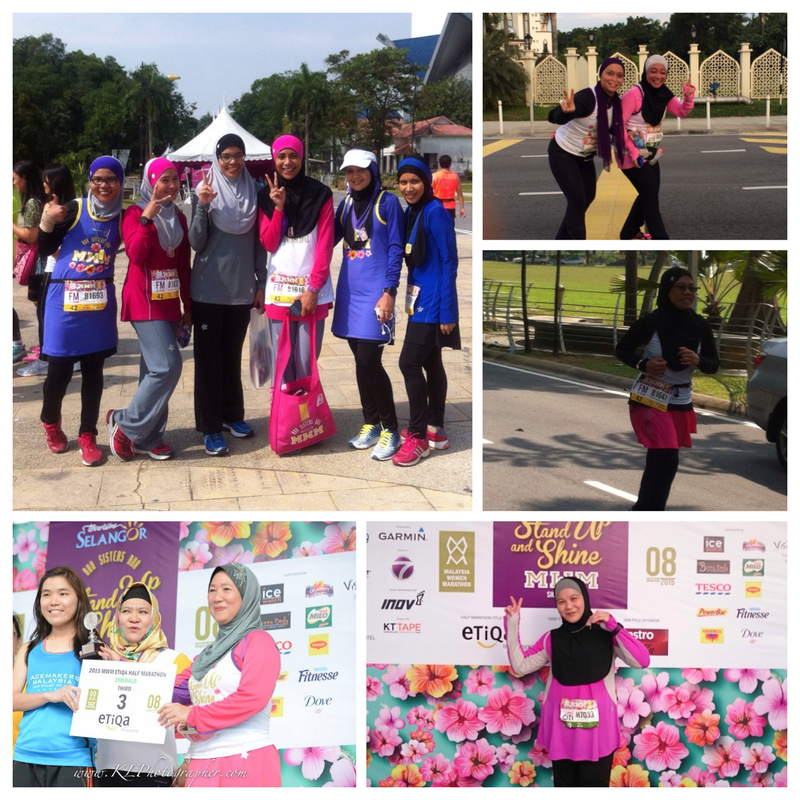 Here’s a story sent by Dr. Rosmurni who was the FIRST to finish 7 km fun at 38.4mins at the LOVE Subang Run 2014 on 9 November 2014. To those who have challenges to find time to keep fit; You are not alone and you should not feel despair. Here’s her story, for the ummah. I would like to share my experience with Nashata. I have been using the Nashata products for a few months back, can’t remember exactly. Oh yes! I purchased for the first time using Nashata coupon when I entered Malaysian Women’s Marathon (MWM) in March 2014. I saw the products displayed at the Dataran Merdeka Shah Alam and felt interested to try it out because of the modest muslimah design and suitable for outdoor activities(which I found rare to find). So,I bought Amin Hijab and Riada Peplum Lite for my first purchase. Later on I repeated my order and bought Heather Ultra top for more performance & Iman Hijab. I have been wearing them since because they are so light and comfy, and most importantly they cover right. I plan to buy more and I would like to congratulate Nashata for producing quality and innovative products. I hope there will be more interesting products coming soon. 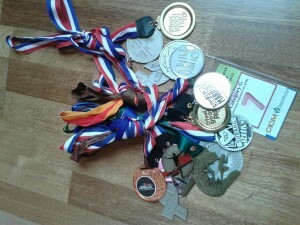 I was a runner in my schooldays and till today, I love running. When I entered University, I just ran for fun and couldn’t do much running due to time constraint. I started having a family upon graduation and work commitment piled up. That was when I stopped running. But after giving birth to my 3rd child in 2007 (my youngest child was 6 years old then), I saw an advertisement in the paper that there would be a Subang Jaya Run. I took my first attempt and I could run again after stopping for many years. I was very happy. It was a 7 km run and completed with a time of 47 mins. It was an awesome feeling and I started running constantly again and never look back. However, Allah gave me a test, I had a miscarriage in 2008 and after a few months Allah gave me his blessings. I got pregnant with my 4th child and Alhamdulillah, I delivered my 4th child in 2009. Right after my postpartum period I started to be active again. Now, I am a constant runner despite being busy as a career woman, a wife to an excellent husband, a mother of four great children and lastly but not least as a daughter of an amazing mother. So they say, Fit Parents Raise Fit kids. Congratulations to Dr. Rosmurni Ismail & family. 🙂 Here are her medals she collected since 2010. Keep going Dr. Rosmurni . If you have stories to share, or feedback do write to us at contactus@nashata.com. We are happy to talk to you. 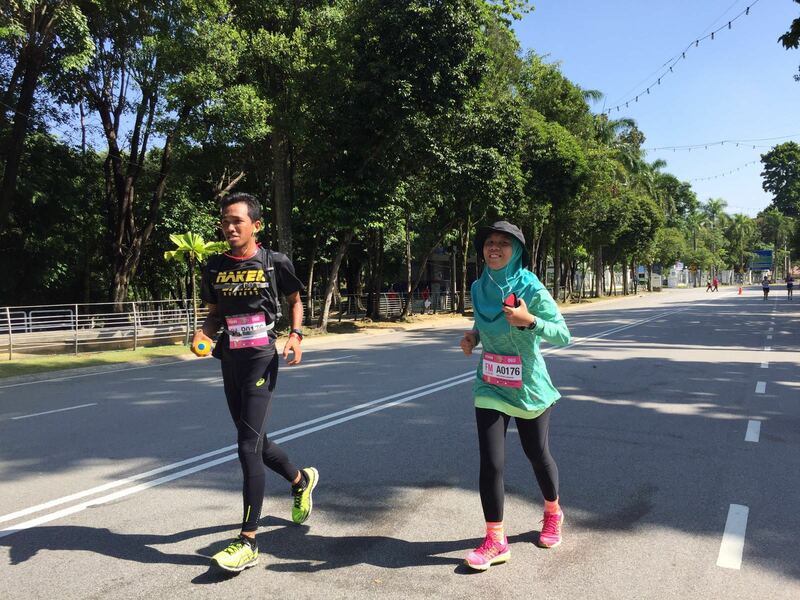 Acara Malaysia Women Marathon yang awesome! 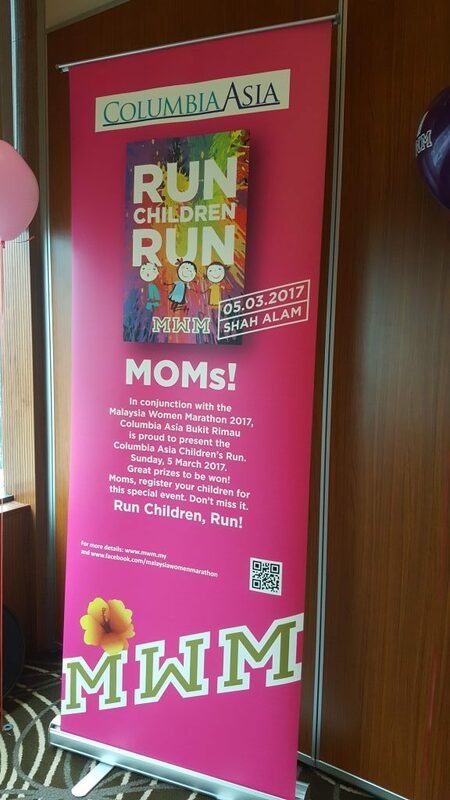 ALHAMDULILLAH, semuanya berjalan lancar untuk Pertunjukan Fesyen dan pelancaran Nashata yang pertama kali dalam program Malaysia Women Marathon (MWM) pada 15 Mac yang lepas yang di adakan di Royal Theater Shah Alam. Kami akan berkongsi cerita yang menarik bersama anda! Kami mengambil kesempatan ini untuk membuat pelancaran NASHATA untuk pertama kali. Segala produk terbaru, kami peragakan oleh model-model professional. Antaranya baju Riada Peplum, T-Shirt Lengan Pendek Keep Calm, Baju Ultra A-Cut, Tudung Amin Hijab, Seluar Aktif Riada, Bag Sukan dan Bag Kasut. Pertunjukan Fesyen ini di meriahkan lagi dengan kehadiran tetamu istimewa iaitu Nur Suryani Mohd Taibi, Penembak Negara Olimpik yang merasmikan pelancaran dangan menulis tanda tangan di baju A-Cut Nashata yang berwarna kelabu. Ratu Muslimah Dunia 2013, Obabiyi Aishah Ajibola juga membuat penampilan semasa pertunjukan fesyen tersebut. 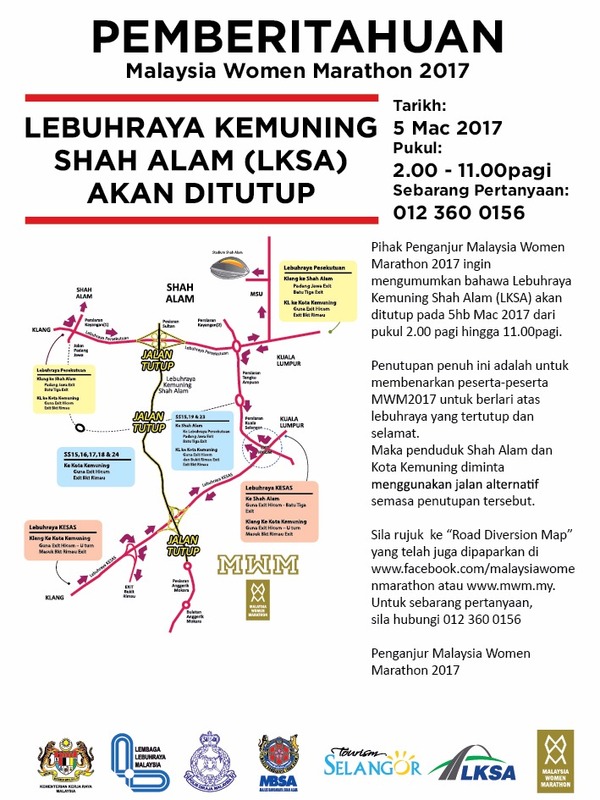 Semua peserta larian berlepas dari perkarangan Dataran Merdeka Shah Alam. 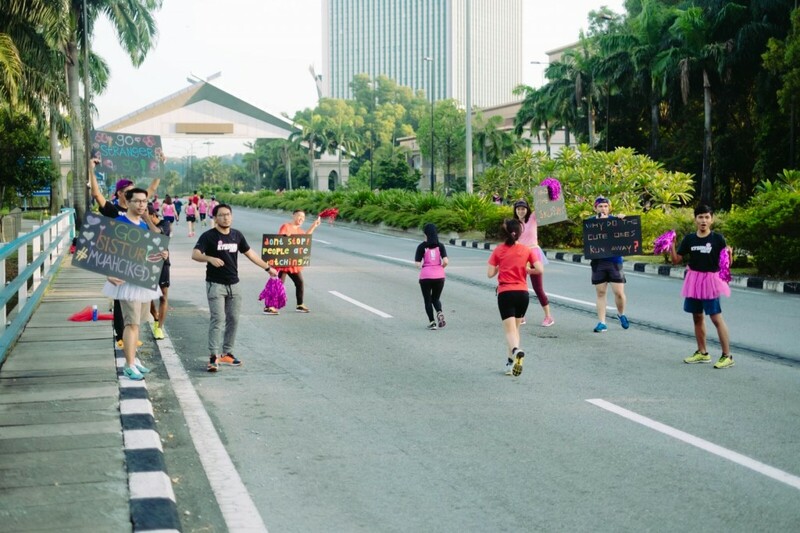 Kami menaja larian 5KM Fun Run yang disertai oleh pelanggan setia dan kaum wanita yang lain dari perbagai umur. 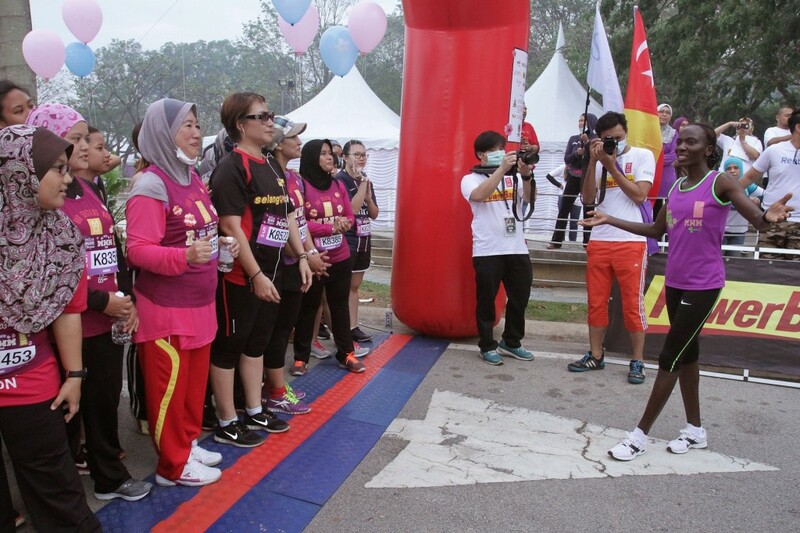 Acara larian tersebut telah di lepaskan oleh Catherine Ndereba dan disertai oleh YB Elizabeth Wong, YB Dr. Daroyah dan ratusan kaum hawa. Walaupun keadaan cuaca ketika itu tidak begitu baik dengan jerebu, aktiviti larian tetap di jalankan seperti yang di rancangkan, tetapi jarak larian dikurangkan ke 3km. 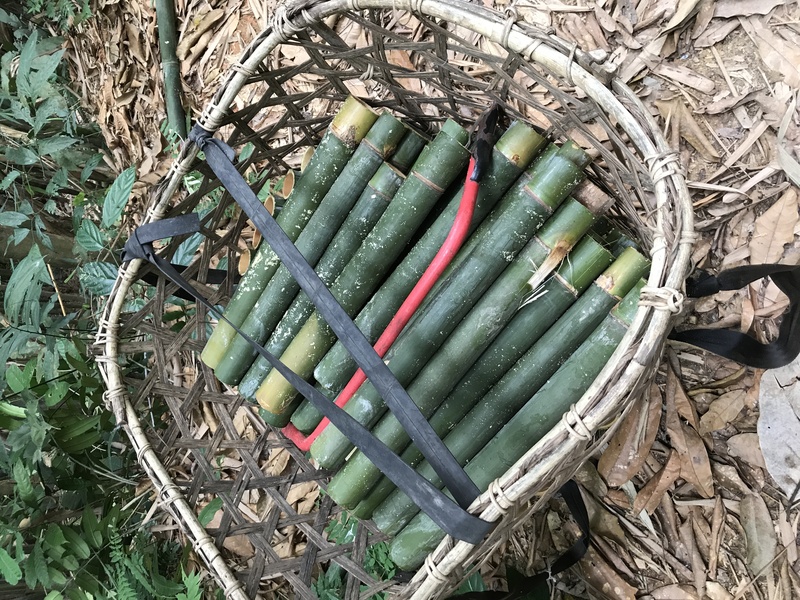 Belon Nashata yang menarik dapat memberi semangat untuk para peserta barlari dengan gembira. 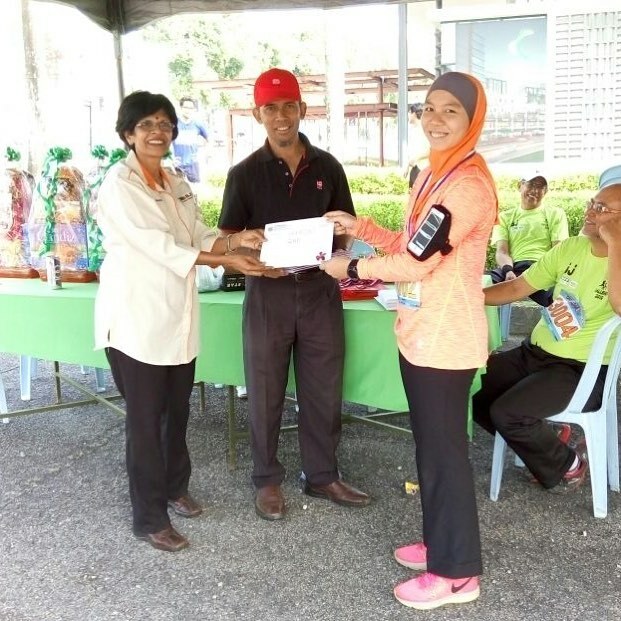 Percaya atau tidak, pelatih industri kami Iman Aida Amirah berjaya membuat larian sebanyak 10km kerana tersilap memilih lorong larian gara-gara jerebu dan tidak nampak dengan jelas. Di kesempatan ini, kami dari pihak warga kerja Nashata mengucapkan ribuan terima kasih kepada semua pihak yang membantu menjayakan larian ini terutamanya penganjur Iron Girl Sdn. 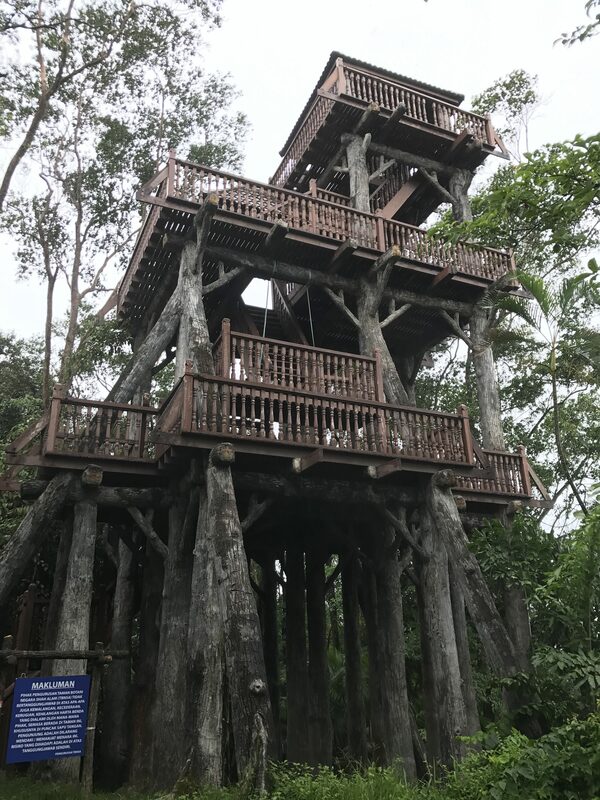 Bhd dan penaja utama Tourism Selangor.